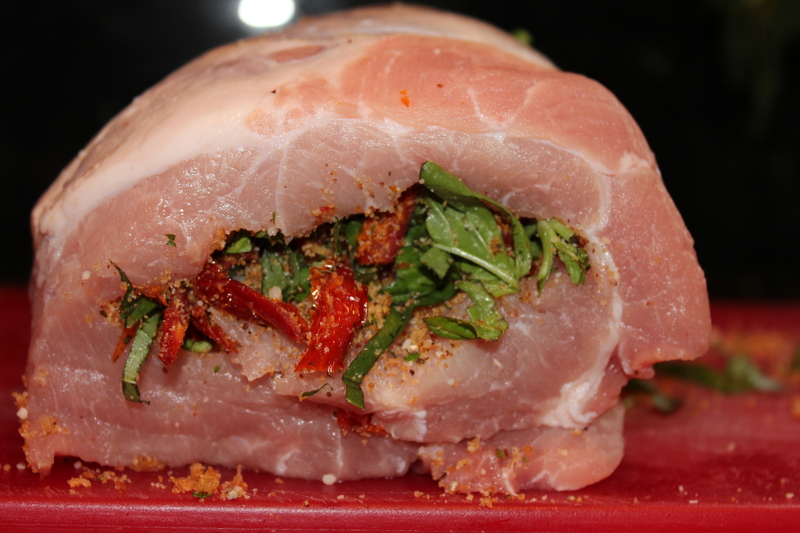 morning, place it covered in a roasting pan and refrigerate for later cooking. 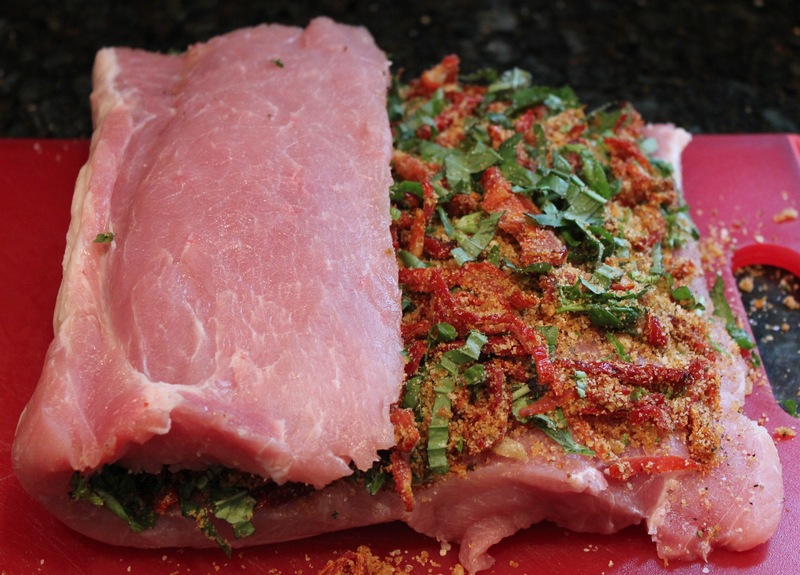 The ideal internal temperature for a moist pork roast is 145 degrees F, if you prefer it less pink, aim for 160 degrees F, but b careful not to overcook or the roast will be dry. Put one tablespoon of the oil in a small covered saucepan over medium-low heat. 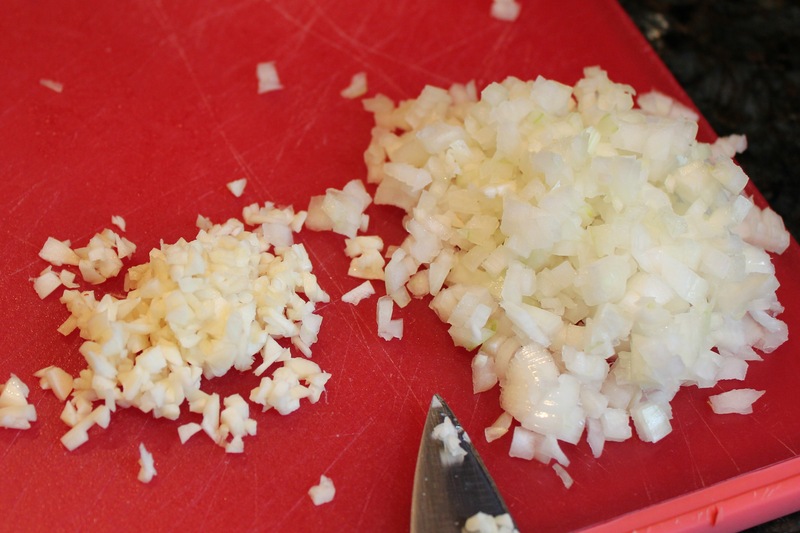 When the oil is hot stir in the onions and garlic, cover the pan, and sweat for a couple of minutes. If the onions are browning, lower the heat. 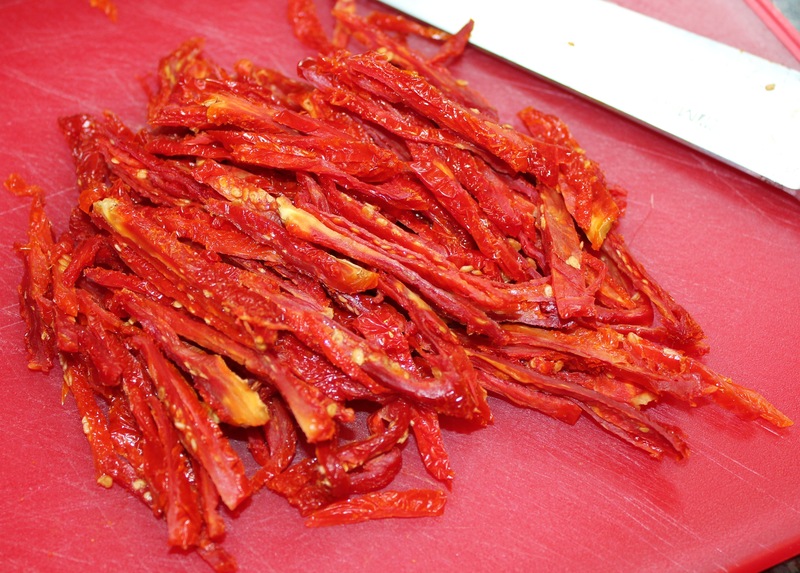 Stir in the sun-dried tomatoes and breadcrumbs, then mix in the remaining oil, and continue cooking. As the breadcrumbs toast, stir to prevent sticking and burning. 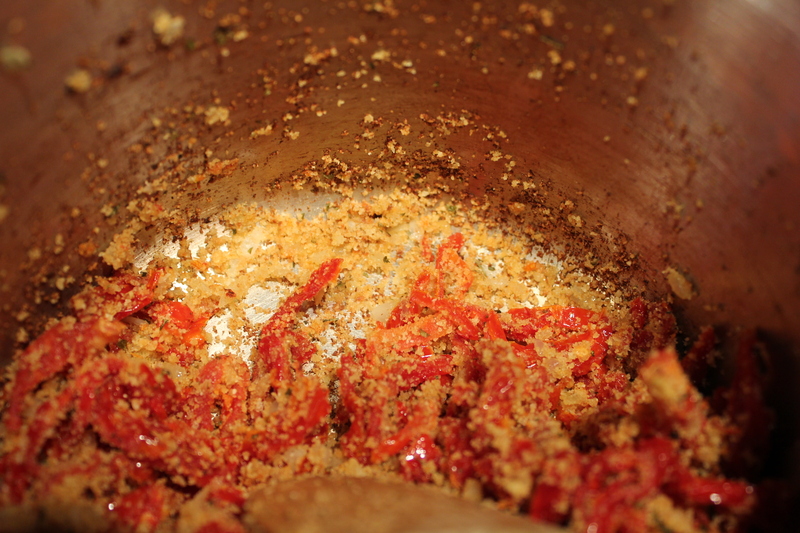 Cook until the mixture is aromatic (toasty) and the breadcrumbs are golden brown. The mixture is done when the breadcrumbs are golden brown. Remove the pan from stove and cool mixture. 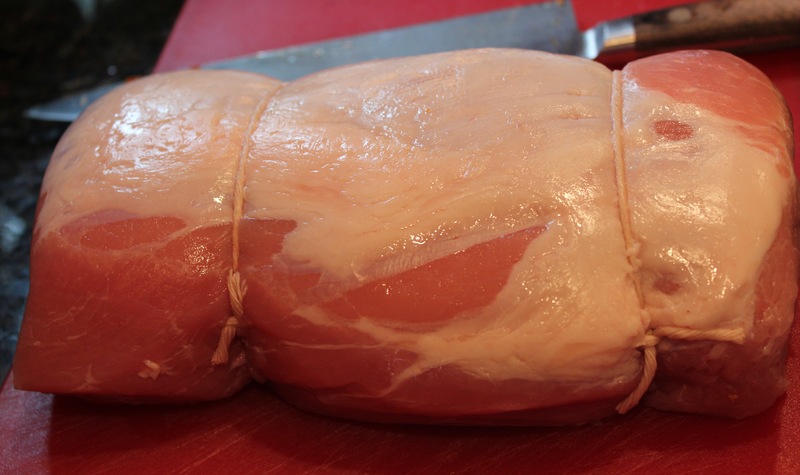 Remove the butcher string from the roast and stand it on its side. 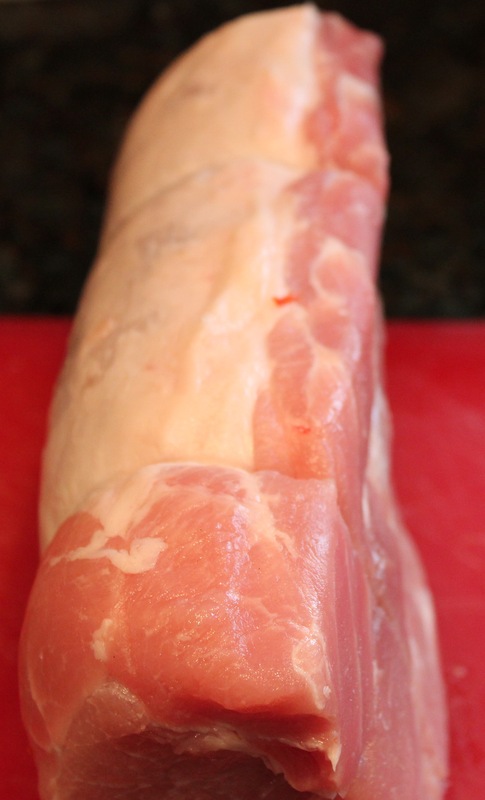 Place your chef’s knife 1/3 of the way across the top and slice through to about an inch from the bottom. 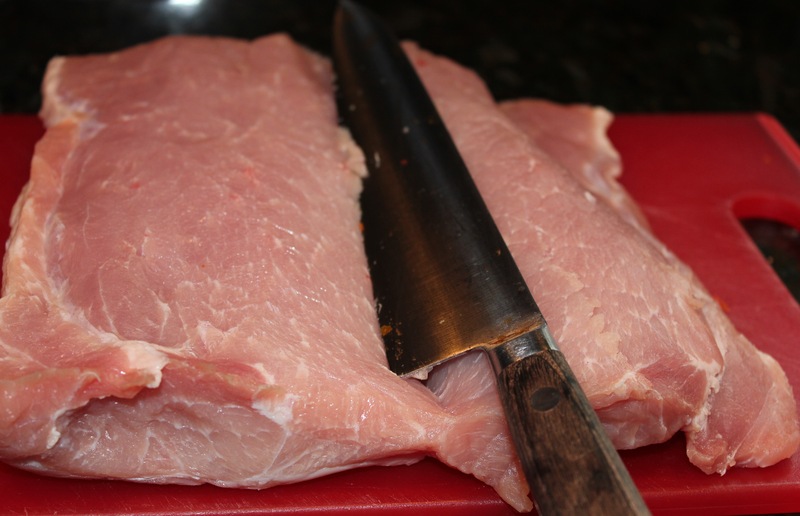 Lay the pork flat on the board and place your knife at the center (2/3 remaining ) of the pork and slice it in half across, again leaving about 1 inch from the bottom. 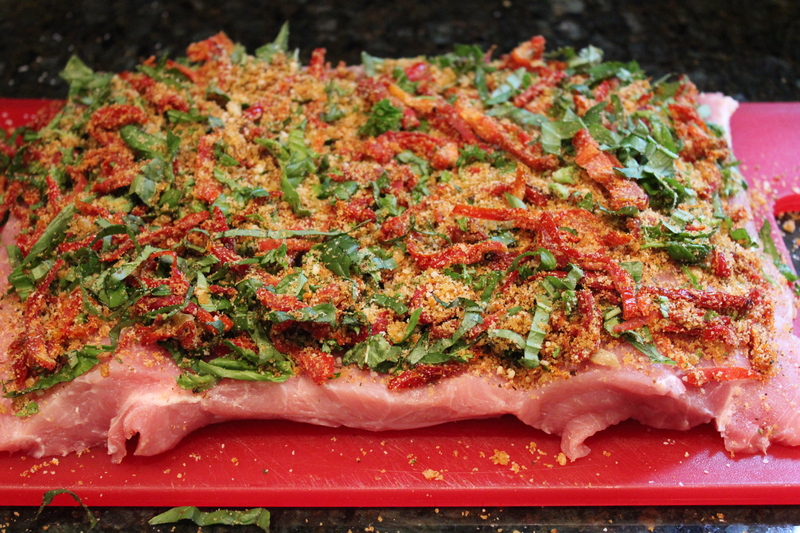 Open the roast flat across the board and season the pork with salt and pepper. 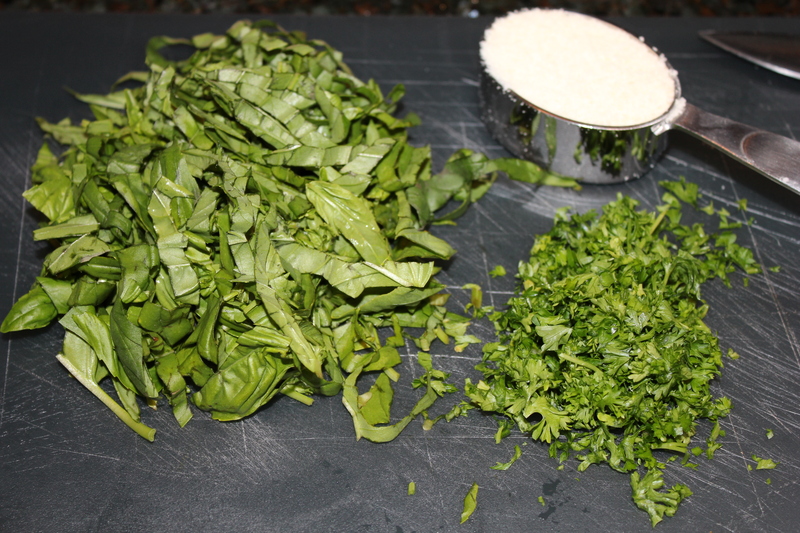 Now, complete the filling by mixing in the parmesan, basil, and parsley. Taste to adjust seasoning, but remember, both the cheese and tomatoes are inherently salty. 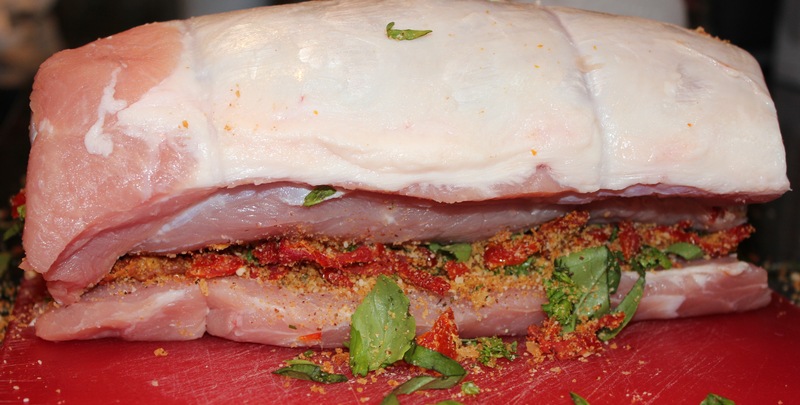 Gently dump the filling over the top of the meat and spread evenly over the surface. Take the interior cut and fold it back in place and then again. 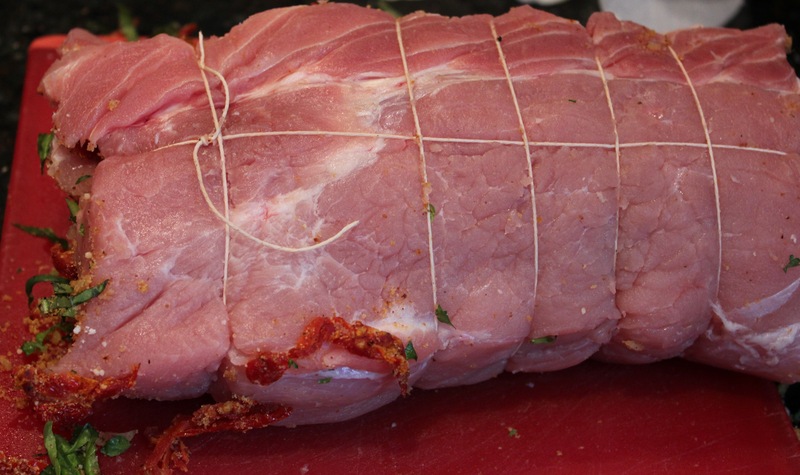 Tie the roast tightly, season all sides with salt and pepper, and place in the roasting pan. Place roasting pan in preheated oven and cook for 15 minutes; reduce heat to 350ºF and continue cooking for another 40-50 minutes, or until internal temperature is 140 to 145 degrees F.
Remove the roast to a cutting and cover with foil and let sit for 8 minutes. 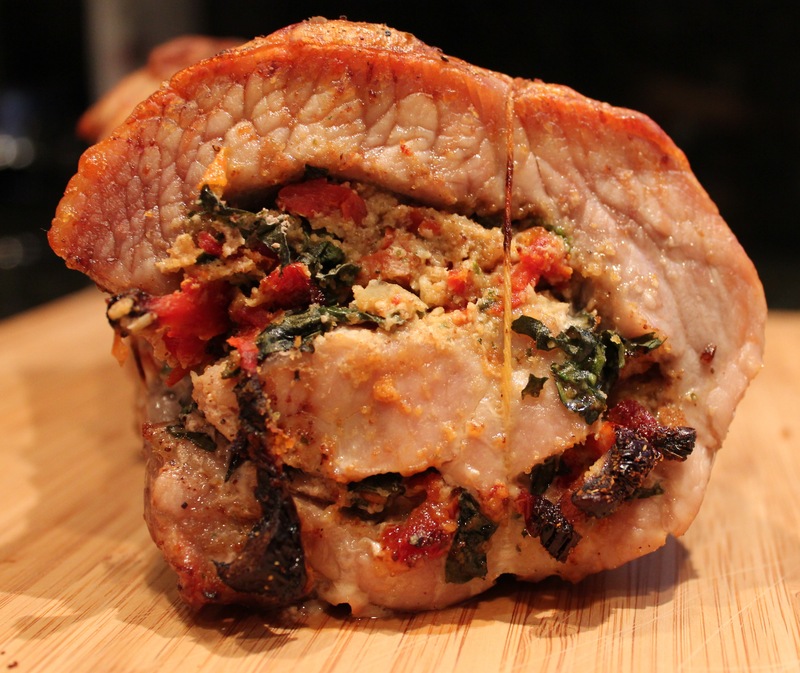 A stuffed pork loin is versatile, the variety of fillings is endless. This recipe uses sun-dried tomatoes, parmesan, and basil. The stuffing can be made a day or two in advance, you can stuff the roast in the morning, place it covered in a roasting pan and refrigerate for later cooking. Put one tablespoon of the oil in a small covered saucepan over medium-low heat. Stir in the onions and garlic, cover the pan, and sweat for a couple of minutes. If the onions are browning, lower the heat. 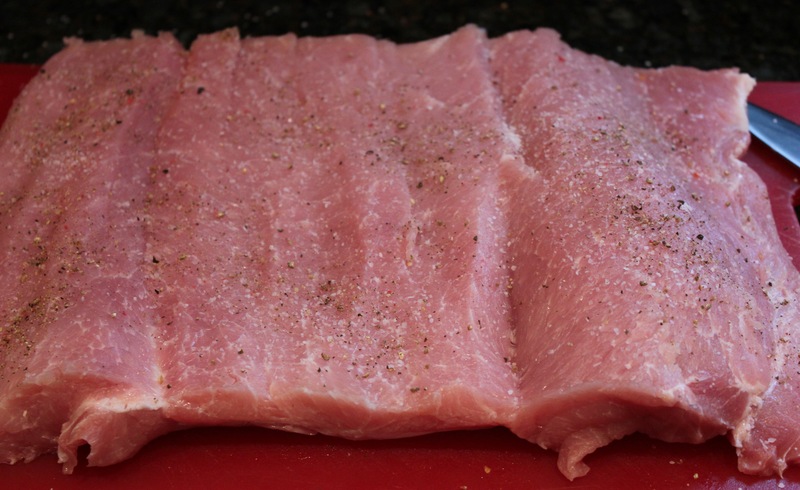 Lay the pork flat on the board and place your knife at the center at the larger side of the pork and slice it in half across, again leaving about 1 inch from the bottom. Complete the filling by mixing in the parmesan, basil, and parsley. Taste to adjust seasoning, but remember, both the cheese and tomatoes are inherently salty. 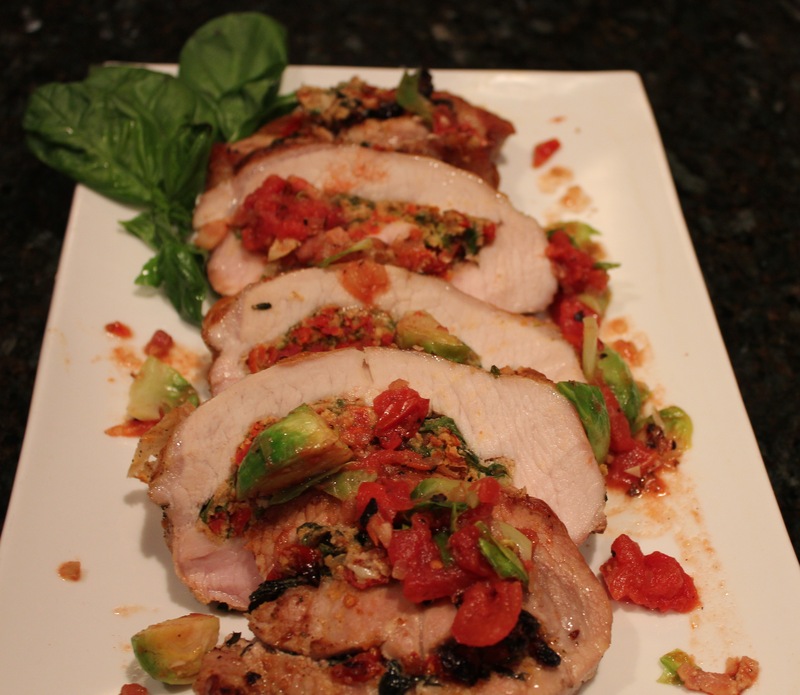 Place roasting pan in preheated oven and cook for 15 minutes; reduce heat to 350ºF and continue cooking for another 30 minutes, or until internal temperature is 140 to 145 degrees F.